A. 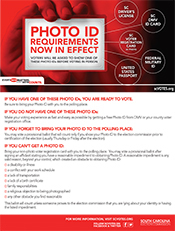 You will be required to show any one of three forms of identification in order to vote: voter registration card, driver's license, or a picture ID issued by the Department of Motor Vehicles. If you registered to vote by mail after January 1, 2004, are voting for the first time since that registration, and did not submit a form of identification along with your application, you will be required to show ID at the polls in addition to your voter registration card. 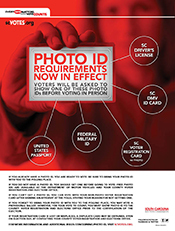 Acceptable forms of this additional ID include: a valid photo ID or a copy of a current utility bill, bank statement, paycheck or other government document that shows the voter's name and address in the county. COLUMBIA, S.C. (January 23, 2008) - To ensure everyone knows where to vote in the Presidential Primaries, the State Election Commission is encouraging voters to check their polling place location. Voters may contact their county voter registration office to find their polling place. 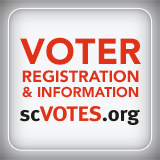 Voters may also visit SCVotes.org to check their voter registration and find their polling place. 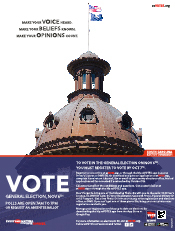 For a list of precincts and current polling places for all S.C. counties, use the "Find Your Precinct" feature on the front page. Voters' precinct names are located on their voter registration cards. Voters who do not have their voter registration card and do not know their precinct name, can use the "Check Your Voter Registration" feature found in the menu under "Voters." COLUMBIA, SC-Voting machines are now available to voters in all 118 Horry County precincts. Some voters cast paper ballots today in 15-20 precincts because voting machines were not ready to accept votes. This issue was due to a human error in preparing the machines for the primary. Before every election, all voting machines are tested to make sure they are operating correctly. One way this is done is by casting test votes on the machine to be sure it is recording them accurately. The final step in this process is to perform a "clear and test" procedure. This resets the test votes recorded on the machine to zero. Without performing this measure, the voting system will not allow machines to be opened for voting on election day. Horry County voting machine technicians worked throughout the morning and early afternoon to visit these affected precincts and perform this procedure. COLUMBIA, S.C. (January 3, 2008) - Absentee voting is currently underway for the January Presidential Primaries. COLUMBIA, S.C. (December 12, 2007) - To help ensure the upcoming presidential primaries run as efficiently as possible, the S.C. Election Commission wants to remind everyone of upcoming voter registration deadlines and urge those already registered to update their registration information. Those who wish to vote in the Republican primary must register or update their information no later than Dec. 19. Those who wish to vote in the Democratic primary must register or update their information no later than Dec. 26. As a reminder, South Carolina does not have registration by party. Registered voters may vote in either party's primary, but NOT both. 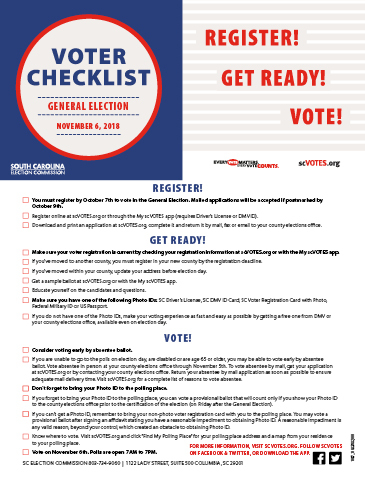 S.C. Election Commission Executive Director Marci Andino said voters can help ensure a smoother voting process for themselves- and other voters- by making sure their registration information is up to date and correct before these specific deadlines. COLUMBIA, S.C. (November 19, 2007) - To help ensure the upcoming presidential primaries run as efficiently as possible, the S.C. Election Commission wants to remind everyone of upcoming voter registration deadlines and urge those already registered to update their registration information. "Having accurate records helps ensure all South Carolina voters cast ballots at the appropriate locations," Andino said. "If a voter updates his registration information, he can reduce the potential for delays when he signs in on Election Day-and that could have a significant impact on wait time for all voters." Columbia, SC (November 8, 2007) - A mass mailing from a private, national group, delivered this week to mailboxes across South Carolina, is causing some confusion with those who receive it. The mailing is from the "Voter Participation Center" in Boston, MA, and is sent in care of "Women's Voices. Women Vote." The mailing reads in bold print, "Voter registration laws require you to submit the attached application," and "To comply with legal requirements, please return the enclosed application." The mailing includes a generic, national voter registration form and a postage-paid return envelope addressed to the State Election Commission. 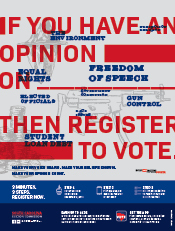 While it seems that the purpose of the mailing is to urge recepients to register to vote before upcoming deadlines, the above statements are very misleading and have confused some voters. If you are already registered to vote, and the information on your voter registration card is still accurate; you are not required to do anything. *Original results required a recount. Recount was certified on November 16, 2007. You may vote in only ONE party's Presidential Primary.